Served mild, medium or hot, with celery, blue cheese or Ranch dressing & pita bread. 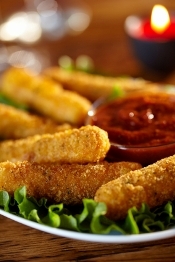 Chicken Fingers served with marinara or honey mustard. Buffalo chicken fingers served w. blue cheese dressing & celery. Available in mini 10", small 14", Large 18". Add from our selection of toppings for add'l charge. Add from our selection of toppings for add'l charge. Substitute whole wheat crust for add'l charge. Served with pita bread & dressing. Available in small or large. 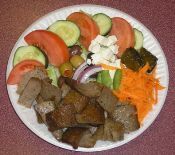 Served with green salad, French fries or rice, pita bread & dressing. Substitute Greek salad for an additional $1. Made from mixed vegetables, oat bran, fresh soy beans, chick peas & herbs. Choice of spaghetti or Ziti. Served with spaghetti, ziti or house salad.